Package includes 38 Mylar Templates By Lori Holt of Bee In My Bonnet. 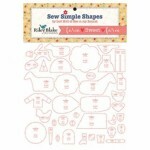 Templates used to complete Lori Holt's Farm Sweet Farm Sew Along. Download the free Sew Along Guide HERE. Join Lori on her blog each week, starting January 28, 2019 for the sewing instructions. beeinmybonnetco.blogspot.com.